If you have a baby, now is your chance to dress him up in absolutely any Halloween costume of your dreams. (Well, almost any—we certainly want to keep our babies safe!). If you're not into cute and cuddly baby Halloween costumes, then go a little kooky and quirky with this fun roundup of bizarre Halloween costumes that will look totally hilarious (or totally inappropriate!) on your little one. Food costumes—whether it’s bacon or sushi—are some of the funniest, most adorable getups in the bunch. Babies are so adorable you want to eat them, right? So why not dress them up like your favorite food? 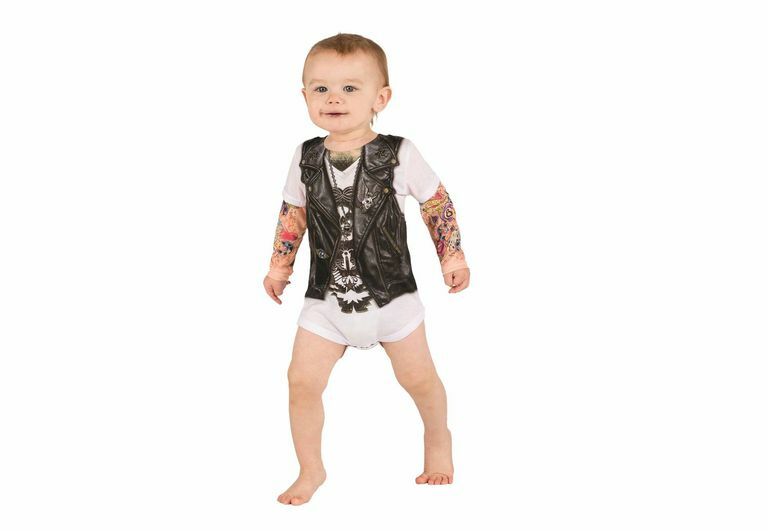 Then there are other costumes that make your baby look ultra adult, like this rough looking baby biker decked out in tattoo sleeves and a black leather vest. The patch of black chest hair painted on the skin-colored undershirt is just a hoot! Just add a pair of tight black jeans, black boots and a do-rag on top for a complete bad-to-the-bone biker ensemble. If you live by the rule that everything is better with bacon, then you’ve got to dress your little ham as a thick slab of juicy bacon for Halloween. The costume is very Lady-Gaga-meat-dress, but luckily without the stench. 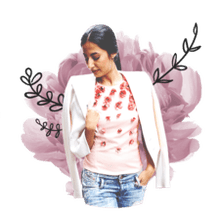 Got another child? Dress him up as eggs. The look on this baby’s face says it all, “Why would mama do this to me?? ?” Dressing a baby as a flesh-colored earthworm doesn’t sound that cute, but this baby looks so cuddly and sweet that I just want to squeeze this squiggly insect up! Get ready for Thanksgiving early with this little turkey costume. Your baby will look absolutely scrumptious (and slightly awkward) as this juicy bird. Just remember not to stuff it. Got twins? Then dress them up as an Asian food duo—ramen noodles and soy sauce. This delicious pair will look crazy cute, especially in this amazing ramen noodle hat. Japanese food never looked so yummy and adorable. Super kawaii! If you love the spicy hot chili sauce Sriracha, then you'll adore this baby Sriracha costume complete with green bottle cap and signature rooster label. This baby will definitely be the spiciest, most adorable kid on the block. When a baby eats spaghetti, it’s a given that he will be covered with noodles from head to toe. Now you can dress up your baby as spaghetti and meatballs without the mess (and stains!) with this hilarious costume. This is the cutest costume EVER! Your baby will look super oishii (delicious!) as a piece of nigiri sushi, your choice of tuna or salmon, with wasabi and ginger attached and a piece of grass behind the rice (the white bodysuit). This costume and its designer were even featured on Martha Stewart’s show, which says a lot about this amazingly yummy costume. This is probably the most inappropriate baby costume ever. A baby dressed in a marijuana leaf will make every (sober) person say, “tsk, tsk . . .” and shake her head in disbelief. But pot leaf or no pot leaf, this baby is still totes adorbs. If you’re a basketball lover, then of course you want to dress your baby up in this darling crocheted basketball hat and basketball net. If you’re headed outside, you’ll definitely want to dress your baby in long sleeves and pants underneath. But a naked baby in a net? Ahhh, so precious! This costume is the next best thing to sliced bread. Your baby will look carb-alicious and oh-so cute as this colorful loaf. To dress up your baby like a prisoner with the words “Lil’ Lawbreaker” written on his chest is almost criminal. But with tattoo sleeves and an old school striped prisoner uniform with matching hat, this little jailbird costume looks nothing but adorable on your innocent child. This has to be the most adorable turtle on earth. But the truly hilarious part of this sea turtle costume is that it apparently turns into a bed for your sleeping baby when he’s tired. Just roll him onto his back for a quick snooze between Halloween festivities. And maybe he can bust out a couple of break dance backspins while he’s at it. Love old school rap? Maybe your little Funky Cold Medina will love it too wearing this hysterical little rapper bodysuit with faux chains and a big printed clock. Your baby will look like a cross between Run DMC and Flavor Flav—only much, much cuter. It’s buttery, it’s salty, it’s crunchy . . . it’s your baby dressed up like movie popcorn. This costume is a total hoot with its strange yellow popcorn wig. Your baby will look more like an Oompa Loompa than a movie snack, but he’ll definitely be the showstopper of the night. Your little stinker will look creepy crawly cute in this stink bug costume complete with antennae, little legs and wings on the back. The front of the costume says “stink bug,” too, to perhaps keep it clear that the costume isn’t a roach—but I’m sure that costume exists, too! Your baby will be all business in this laugh-out-loud funny businessman costume. Just trade the fedora for a messy windblown blond wig and you’ll have a baby Trump on your hands. If you have a gassy baby, this may be the perfect costume for your kiddo. Pffft . . . was it the baby? Or was it the whoopee cushion? We’ll never know, but all we know is that your babe will probably win best costume in this hilarious getup. This baby may be a strange looking candy corn, but he’ll be the sweetest one on the block. Your little one will keep warm in this knit cocoon and adorable matching hat. But your munchkin may get frustrated that he can’t reach for any candy with his arms tucked inside.